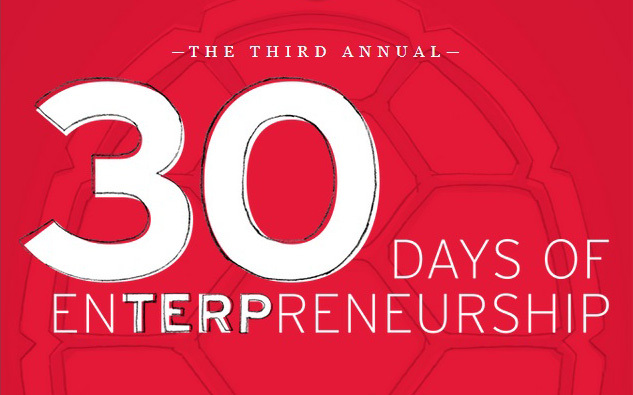 The University of Maryland kicked off today its third annual 30 Days of EnTERPreneurship, a month-long celebration of the university's fearless ideas, innovation and impact. "The University of Maryland has long been a pioneer in entrepreneurship and a leader in research and academic innovation. And in recent years, the university has put even greater, campus-wide emphasis on preparing faculty, students and staff to tackle the world's toughest problems through innovation and entrepreneurship. Our '30 Days of EnTERPreneurship' highlights and celebrates that commitment across all schools," says Dean Chang, UMD's associate vice president for innovation and entrepreneurship. This year's showcase of events, lectures and contests begins today with the 3rd annual ACC Clean Energy Challenge, part of the Startup America Initiative that supports and empowers the next generation of American entrepreneurs. This $100,000 university green technology business competition is led by UMD in partnership with the U.S. Department of Energy. For the ninth year, Under Armour Founder and CEO Kevin Plank '96, will partner with UMD to host Cupid's Cup on April 4. This nationwide student competition awards $115,000 in prize money to the country's top student entrepreneurs, and brings together hundreds of students, faculty, staff and entrepreneurs from various industries. 30 Days of EnTERPreneurship continues on April 26 with Maryland Day – the university's campus-wide celebration of innovation, creativity and academic excellence. The 16th annual open house attracts more than 100,000 alumni, students and community members to more than 450 family-friendly events and exhibits that teach and inspire future innovators. On April 29, UMD students will compete to make the greatest social impact for causes in the annual Do Good Challenge. Finalists can earn up to $5,000 for their cause, as well as other prizes, such as in-kind consulting, to further advance their cause. This year's judges include sports agent David Falk, and former NFL quarterback and current CBS Sports analyst Norman Julius "Boomer" Esiason '84. UMD prides itself as a pioneer in educating the next generation of innovators and entrepreneurs, ranked as one of the nation's top public schools in the U.S. for entrepreneurship and innovation. The Princeton Review ranked UMD No. 6 among public universities and No. 15 overall for its undergraduate entrepreneurship program, and No. 8 among public universities and No. 16 overall for its graduate entrepreneurship program. The university was also recognized as No. 1 among public universities and No. 2 overall for tech entrepreneurship by the 2013 StartEngine College Index. Visit www.umd.edu/30days to learn more about these and other special events. Follow the coverage of the events by tracking #30DaysTerps on social.